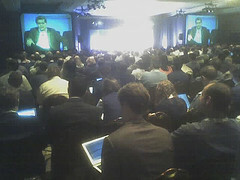 Technologists, investors and journalists have packed the Argent Hotel today for Web 2.0, including many gilded as well as scarred veterans of the first Web boom. The Web 2.0 Conference, now in its 2nd year, feels much like the Demo conferences of the late 1990’s – meaning, John Battelle‘s hand-crafted industry gathering has quickly established itself as a preeminent gathering and oracle of the information technology sector. My modest contribution to the event coverage takes the form of a photostream, mostly capturing a defacto reunion with numerous colleagues from the once-mighty ExciteAtHome.